Maybe now they’ll come out with “Brawling Drunks” paper dolls. Remember when airline travel was sort of glamorous? When people got dressed up for it? 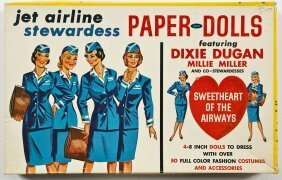 When Dixie Dugan became an airline hostess (“stewardess,” back then)? Our culture has somewhat coarsened in the interval. This weekend, aboard a Ryanair flight from Tenerife to Glasgow, two drunks got into a fistfight, quite alarming for the other passengers, and the guy who tried to break it up–well, he got his nose bitten off, according to several witnesses (https://metro.co.uk/2019/03/17/ryanair-passenger-nose-bitten-off-brawl-kicks-off-flight-tenerife-8917945/). The two brawlers were arrested by police when the plane landed. An old proverb says, “Those who in quarrels interpose/ Oft must wipe a bloody nose.” And how. The poor guy–he was only trying to do what he thought was right. He can’t help it that the ambience of an airliner has come to resemble that of a saloon in an old Western. All they needed was somebody at the piano playing Oh, Them Golden Slippers. This entry was posted on Monday, March 18th, 2019 at 3:38 pm	and tagged with airline travel, brawling aboard an airliner in flight, coarsening of the culture, culture rot, Dixie Dugan, man gets nose bitten off, Oh Them Golden Slippers and posted in news. You can follow any responses to this entry through the RSS 2.0 feed. It’s astounding. It’s almost as if civilization has vanished. Civilization? Oh, yeah–I remember that! For a moment there, I thought I’d only dreamed it.